Everybody has demons. We’re all beset by monsters that sooner or later we have to face and in Phases, Moon Knight finally admits what, and who, helped make him the man he is. As it turns out, it wasn’t just Khnonshu appearing before a three quarters dead Marc Spector and saving his life by transforming him into his avatar of justice that changed our hero into the lunar vigilante. No, old Khonshu just built on the foundations that had already been laid by Marc’s childhood rabbi, who’s secret burrowed its way into a pubescent Marc’s psyche after he unwittingly discovered it. There that secret lay, buried in Moon Knight’s mind slowly gnawing at him and everything that he was, until the day, on his journey to be a better man and father, he finally let it out and all hell broke loose. Everybody has monsters and Phases is the story of how Moon Knight, and his collective personas, came face to face with the oldest and most dangerous of his and vanquished it. 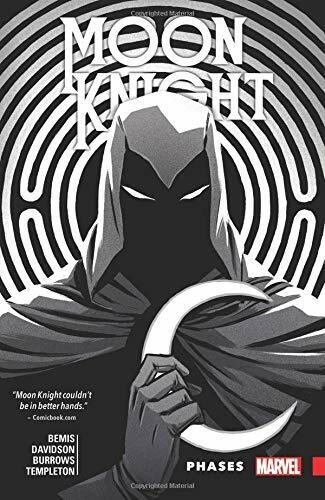 Nothing in Marc, Jake, Stephen and Moon Knight’s life is ever simple or straight forward though and on the path to conquering his very own, near immortal and psychotic nazi would-be superhuman, he crosses paths with the Collective. A hive mind and body knitted together by science and the willing, and not so willing, flesh of a group of disparate individuals and strangers, the Collective makes the grandest mistake of its brief life when it absorbs Moon Knight who’s own collective mind fights his the big bad Collective’s in the unlimited confines of its constantly expanding mental landscape. Having faced the Collective, it’s time for Moon Knight to crash the initiation ceremony of a society of sadists and plunge headlong into the conflict of his life, one that sets him on a collision course with more personal truth than anyone should ever have to deal with; truths that are delivered by his oldest monster, the one that he’s kept hidden in the deepest, darkest closet of his troubled mind.